What is a journal transaction? A journal transaction is an entry into Cash Manager Focus with no amount to reconcile back to your bank account. It generally contains at least two lines; an expense and an income line that both total to $0.00. Create a new bank transaction by clicking on Create New - Money Out. TIP: If you're invoice basis for GST, make sure to create a new invoice so that the transaction details are pulled into your GST return. Leave the Amount as $0.00 as funds haven't moved through the farm account. Make sure the figure sits inside brackets so that step 3 is correct. TIP: Scroll to the bottom of this topic to find out more about information you can record for the date, other party and account. The first coded line should reflect the item that you're claiming the GST for. Use the relevant note and make a clear note. The Line amount should reflect the gst inclusive amount that was paid for the item. 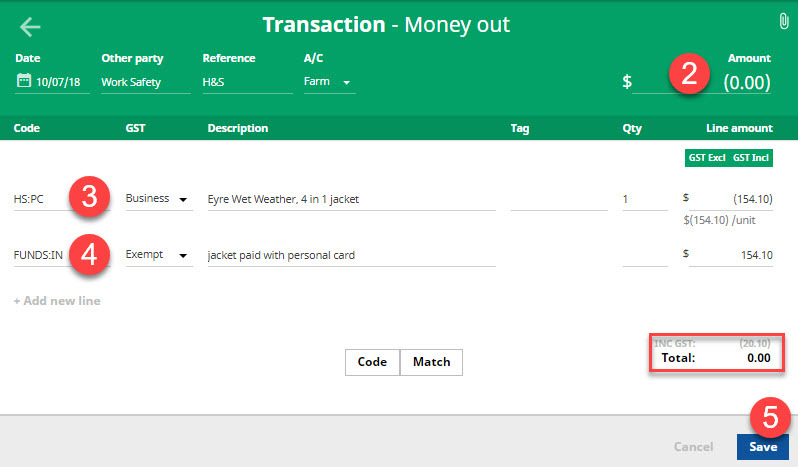 Click Add new line to create the next transaction line. This line should reflect the funds that were used to pay for the item and are usually exempt from GST. A code like FUNDS:IN (Funds Introduced) is good to use as it doesn't have a gst component. Make sure that the income amount for this line is identical to the Line amount sitting above it. If the journal transaction has been entered correctly, the Total should equal 0.00. Click Save. What does this do to my bank balances? Because the total transaction equals $0.00 this won't affect the bank balances in your working plan. For the same reason, the balance in the Actuals screen should also reconcile to your bank account. Could be the date on the receipt. The date also determines what GST period and what month in your working plan, the item will appear in. Could be the supplier the item was purchased from. This information is displayed in reports. Most likely the farm bank account. Though the item will appear in the working plan and reports, it won't distort the cash balance in your plan. $0.00 as nothing has actually happened in the bank account.